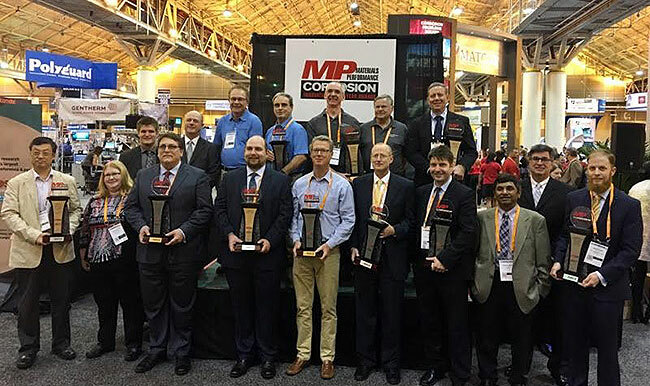 Materials Performance (MP) Magazine is honoring the 10 winners of the 2019 MP Corrosion Innovation of the Year Awards program with a special ceremony today. The event will be held on a stage just outside the main Exhibit Hall entrance at 4:45 p.m. In all, the global corrosion control community submitted more than 50 nominations for the program, setting an all-time record. The complete list of finalists is available at the event web site, along with full descriptions of each innovation. The 10 winners will not be publicly disclosed until Monday’s ceremony. Now in its fourth awards cycle, the program provides a forum for NACE International members and customers to showcase their corrosion mitigation technologies and receive recognition for their innovative solutions. Winners were selected by a panel of corrosion-control experts spanning a diverse range of subject matter expertise from across the industry. To be considered a corrosion innovation, nominated projects are required show the potential for a significant positive impact in corrosion control. Innovations can be related to coatings and linings, materials, design, equipment, testing, monitoring, integrity assessment, cathodic protection, chemical treatment, or anything else that directly relates to corrosion prevention and mitigation. Anyone worldwide involved with corrosion control, including individuals, companies, organizations, and governments, is able to submit a nomination. There is no fee to enter the program. Does the description provided adequately describe the innovation—how it works, its purpose, and what makes it innovative? Does the innovation improve an existing corrosion-control solution or provide a new solution where none previously existed? Has the nominator sufficiently demonstrated that the innovation works as described, either by providing laboratory or field test results? Can the innovation be incorporated into existing corrosion prevention and control activities? Does the innovation benefit the corrosion-control industry? The developers behind each innovation selected for an award will be presented with one trophy at Monday’s presentation. Additionally, winning innovations will be highlighted in MP’s print magazine and at materialsperformance.com throughout the year, beginning in April. Monday afternoon’s ceremony for the winners will be live streamed on MP’s Facebook page, where it will also be available for archived viewing. More than 100 attendees packed the Protective Coatings Workshop area of CORROSION 2019's Exhibit Hall on Tuesday to learn tips on best practices as well as new techniques and technologies available to coatings contractors. The city of Nashville,known as the “Country Music Capital of the World,” has a diverse and deeply-rooted history that began well before its official founding on Christmas Eve 1779. From its bustling music scene, southern hospitality, and eclectic food, Nashville welcomes over 15 million visitors a year and is home to some of the nation’s most recognizable landmarks. PHMSA (Pipeline and Hazardous Materials Safety Administration) and NACE members play a critical role in protecting the public from potential catastrophic failures of liquid/gas pipelines. Join policymakers, regulators, and industry experts for a discussion on how PHMSA and other agencies address corrosion in pipeline safety. The forum will provide both regulator and industry perspective on best pipeline safety practices and the latest developments.